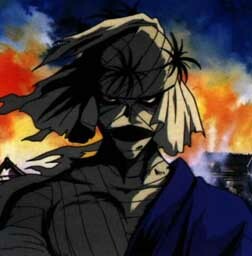 Rurouni Kenshin, the wander, a swords man and man slayer left over from the Meji Revolution. Carrying a reverse blade sword for his weapon Kenshin travels around. This is a funny and serious anime all at the same time. Joined by Kaoru, Yahiko, Sanosuke and so many other so make a grand adventure out of just dealing with every day life and the trials that seem to come there way. There are two parts to this the OAV which is very serious and holds deeps thoughts within it and the TV series that is a light on the lighter side. The OAV has different characters in it and shows a lot about Kenshin�s past. The TV series takes place about 11 years after the revolution is over with. I recommend you see BOTH! Rurouni Kenshin takes place in feudal Japan in a time where .... Enter Kenshin, a former assassing who is trying to attone for his past misdeeds by trying to help others. He befriends a group of stange but friendly people who like him for who he is now and don't judge him for his past. The signature of Kanagawa treaty in 1853 provoked a great impact among Japanese nationalists. Initially a struggle between pro and con of the westernization of Japan, it degenerated to a dispute between pro and con of Tokugawa regime. The latter was formed essentially with Shimazu and Mori clans and nobility of Kyoto. Though numerically inferior, but better equipped, they defeated Tokugawa army at the battle of Toba-Fushimi in January 1868 and Tokugawa regime collapsed soon. Revolution in Japan which toppled the Tokugawa shogunate, "restored" imperial rule, and transformed the country from a feudal into a modern state. The opening of Japan's ports to Western colonial fleets, coerced by Matthew Calbraith Perry and others from 1853 onwards, exposed the weakness of the Tokugawa shoguns, and triggered nationalist unrest, under the slogan sonno joi ("revere the emperor, expel the barbarians"). Radicals inspired by the ideas of Motoori Norinaga saw a solution in the revival of imperial "direct rule"-especially young samurai from the western daimyo fiefs of Choshu and Satsuma, which had never embraced Tokugawa soverainty. By the 1860s shogunate and daimyo were importing Western technology and proposing new governmental structures to meet the foreign threat. In 1867 pro-imperial daimyo suggested that shogun Tokugawa Yoshinobu should step down and acknowledge imperial authority. Yoshinobu agreed in principle in November 1867, but mistrustful Satsuma radicals seized the imperial palace in Kyoto on January 3, 1868, and proclaimed a restoration under the young Emperor Meiji. Yoshinobu's forces were thrown back from Kyoto, and an "imperial army" of Choshu, Satsuma, and Tosa clan forces secured peaceful surrender of the shogunal capital Edo. Most daimyo stayed neutral, and the civil war ended in 1869. Yoshinobu retired and left government to Saigo Takamori, Okubo Toshimichi, Kido Takayoshi, and other restoration leaders. Confiscated Tokugawa estates comprising some 25 per cent of Japan's arable land were put under their control, providing a springboard for broader policies. In 1869 the emperor moved to Edo, renamed Tokyo ("Eastern Capital"), the new imperial capital. The emperor was used by the new government as a focus of national loyalty and the sanction for the revolutionary changes they introduced. By 1871 the daimyo domains had been surrendered to the throne and standardized into prefectures, and the daimyo pensioned off as members of a new nobility. Mass education and military conscription were introduced, and curbs on Buddhism inspired by the regime's pro-imperial Shinto ideology produced iconoclastic outbreaks. Western experts were imported to create new railways, armies, fleets, and industries, building on pre-Restoration efforts. Samurai discontented with the abolition of their privilege of wearing swords and the taxing of their stipends rebelled, especially in the Satsuma Rebellion of 1877, which was defeated by the new conscript forces. The Bank of Japan was established, fiscal policy reformed, and civic unrest firmly suppressed. An authoritarian constitution, drafted by Ito Hirobumi and others, was promulgated in 1889, establishing the Diet, but for most of the Meiji era power was exercised by an informal Choshu and Satsuma oligarchy outside constitutional controls. Through the Sino-Japanese War and Russo-Japanese War, Meiji Japan won the right to be treated on a level with the Western imperialist powers. Despite an astonishingly fast and successful modernization, the ambiguous constitutional structure, military orientation, and nationalist ideology bequeathed by the Meiji Restoration led Japan to the disastrous imperialist adventures of the 1930s and 1940s. Period beginning with the disappearance of Edo shogunate in 1868 and ended with the death of Emperor Meiji in 1912. The first half period is characterized by the fast westernization of Japan and a great number of popular revolts provoked by this reform. Once internal situation had been stabilized, Japan tried to capture colonies as other western powers. This was materialized through 2 great wars: Sino-Japanese war (1894-1895) and Russo-Japanese war (1904-1905). 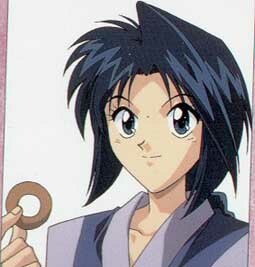 Kaoru is the person who Kenshin leaches off of (you know her food, dojo, etc) Kaoru is the assistant Master at the Kamiya dojo. She teaches Yahiko the ways of the style that her father started. She is very much in love with Kenshin but does not get close to admitting it. She is a horrible cook but everyone eats her food and does not complain too much about things. Kauro is the only money maker at the dojo and she lets everyone know it. In the end she does really care for everyone and it shows. Yahiko is a boy without parents that is learning sword from Kaoru. 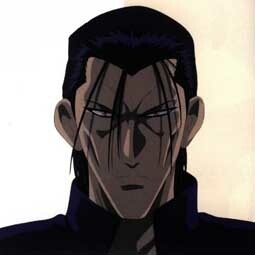 He was saved by Kenshin from the mobsters of that time and joined in the group at the Kamiya dojo. He is the son of a samurai and learns to protect people. You watch as Yahiko grows from a small boy till he learns about what is important in his life. He makes new friends along the way and even tries to save people every now and then. Sano is a survivor for the revolution. He is one that has his reason for hating the Meiji era and the people that created it. We first meet him when he is hired to kill Kenshin, but first is interrupted but the small grandkids of the doctor and the second time Kenshin takes him down. 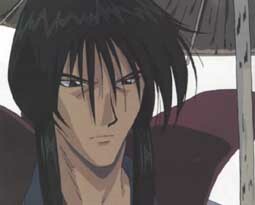 Sano takes quite a beating and falls only after words from Kenshin change his mind about a few things. 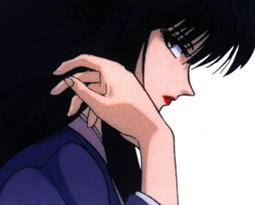 We follow Sano�s progress as he goes on in the story and she search to get stronger and not be a problem for Kenshin. There is real growth in this character. In the series Megumi is one that you first start off looking at her as if you are not sure what she really is. Good or bad that is. Megumi is a wild woman doctor that really knows her stuff. Kenshin saves her from a life of making opium. She helps the local doctor and is not easily accepted by the people. It takes a few times for them to understand she is just as good of a doctor as a man is. 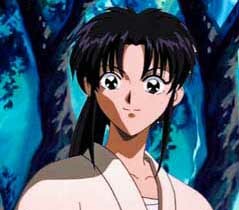 She also fights for the love of Kenshin with Kaoru. In the end she is a doctor and follows the path of saving lives. Misao shows up during the Kyoto series, mainly to lighten the mood. Anyway, she is the grand daughter of the late Oniwabanshu (before Shinomori) and was in search of them. She's a little... uhm... wreckless, curses a lot, quick tempered, stubborn and at times not all that bright. But she adds to the atmosphere in the series. 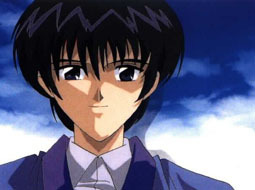 Aoshi is the leader of a ninja group known as Oniwabanshuu. They were hired by Kanryu (the pimp looking business man) to watch Megumi. 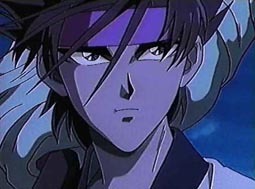 His life and Kenshin's become more intertwined as the series progresses. He seems to be the type of leader one would feel honored to follow even though he's a little ruthless. And after the initial meeting with Himura-san, vindictive and the potential to be evil. 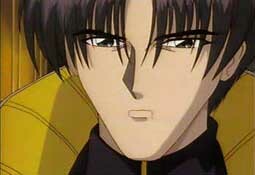 Hajima Saito best know as the wolves of Nibo. She was one of the Shinsengumi and is the last survivor of them. He is not really on their side as much as Kenshin is useful to get rid of Shishio. He fights on the side that is the most just and does not do things for money. (Shocking facts are that he is married!) He works for the Meji Government to fight those that would over throw that government. He has no regrets about killing those so that he can accomplish his goals. Another not so nice person. He's a little insanse and revels in death and destruction. He'll kill anyone and everything that gets in his way of conquering Japan. Shishio is extremely smart and his skills rival those of Himura Kenshin's. He is not a force to be reckoned with. 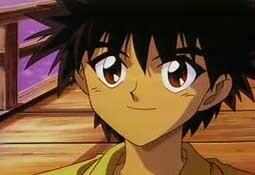 During the series Seta seems devoid of all emotions but one- he always looks happy. So he appears rather easy going but deep down inside he's a rather dark character. Since he's held them in for so long he no longer feels them but when they do come out it's almost like an explosion (well, it doesn't happen until a WHOLE LOT later.) Seta doesn't care if he hurts people, he's just happily doing what Shishio tells him to do. He is perhaps one of the more complex characters in the series.